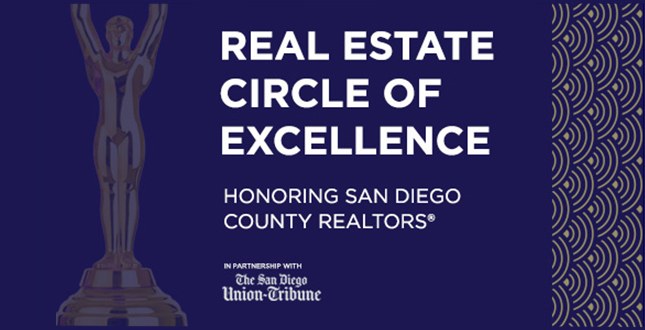 The Greater San Diego Association of REALTORS (SDAR) honored San Diego’s top real estate producers and members who exemplify excellence at their annual “Circle of Excellence” award gala on Saturday, January 21, 2017. 2016 marked the inception of the SDAR’s “Recognition of Excellence” award. The award was created to recognize the top 1% of real estate professionals in San Diego County for production as an individual or team with a minimum of 15 units sold and $15 million in sales. Pacific Sotheby’s International Realty agents had a strong showing at the event. We are proud of our team leader - Jim for reaching the GOLD INDIVIDUAL Status (Individuals selling at least $25-50M or 25 units).